Of all the technology you use on a daily basis, you probably pay the least attention to the mechanical miracles that keep your home or your gym bag secure. Locks and keys have been around for millennia, but they are undergoing one of their rare historic shifts—from mechanical to electronic, from isolated to interconnected. This change is one of the most extreme innovations in security since the invention of the wooden pin lock in Mesopotamia, some 6,000 years ago. Where the original locks gave people the ability to leave possessions unattended, the locks of the future could serve as attendants themselves, personalizing security and keeping track of who is coming and going. Whether that’s an improvement over carrying around anonymous, crooked pieces of metal to get into our homes is an open question. The earliest known locking mechanisms were discovered by archaeologists in the mid-19th century at the Palace of Khorsabad in modern day Iraq. The rudimentary key and lock system dates back to 4000 B.C., when the area would have been the Mesopotamian kingdom of Assyria. The wooden design is remarkably similar to modern-day locks—or at least the underlying principle is the same. It’s known as a pin lock. Basically, pins of varying length inside the locking mechanism would prevent the door from opening unless the proper key was inserted. The key would push the pins up so that the wooden bolt that kept the door secure could be moved out of the way. At this point in history, the only alternative to this simple lock for securing a door would have been posting a guard there. So you can comprehend the convenience. The ancient Egyptians improved upon the Mesopotamian design and are largely credited with popularizing the use of a key and lock in architecture. Though the locking mechanism was still made of wood, the Egyptians often used brass for the pins. The slightly more advanced locks would have looked a bit like this. The simple key-and-pin principle has persevered over the century. It spread from Egypt to Greece and eventually to the Roman Empire, where it was further adapted to smaller locks that could secure chests and drawers. Apparently, affluent Romans would wear their keys like rings so that other patricians would know that they were rich enough to own things that needed protection. The basic design of the wooden pin lock remained largely unchanged until the Middle Ages, when English craftsman made the first all-metal warded locks. These locks feature a keyhole with a cylinder on the far end. Inside the keyhole were a series of concentric plates, or wards, that would block a key from turning unless the pattern of notches on the key matched the pattern of wards. 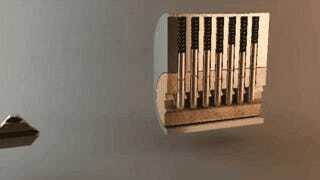 If the key turned freely, it would engage or disengage the bolt when turned. Warded locks remain in use today, though they’re largely found at historic sites where they’ve been keeping out imposters for centuries. The keys themselves will look familiar to anyone who’s ever dreamed of living in a castle or joining a secret society. They’re beautiful! But the handsome contraptions have their faults. The patterns of wards and notches provided the security of keeping the key from one lock from turning in another. If you knew the correct basic key shape, though, you could file down the key’s notches to avoid the wards altogether, making a skeleton key. This way, the key would essentially be one giant notch, free to turn unobstructed past any arrangement of wards. The feature was handy for the lord who wanted to be able to unlock every door in his castle. It was even handier for the thief who also wanted to unlock every door in the castle. While they weren’t perfectly secure, these warded locks did usher in a new era of craftsmanship. Skilled metalworkers were employed as locksmiths, designing and building ornate locks and keys that matched the architecture of the estate. By manipulating keyhole shapes and adding complexity to the wards, locksmiths could increase security. But the workmanship of skeleton keys advanced along with that of the locks. 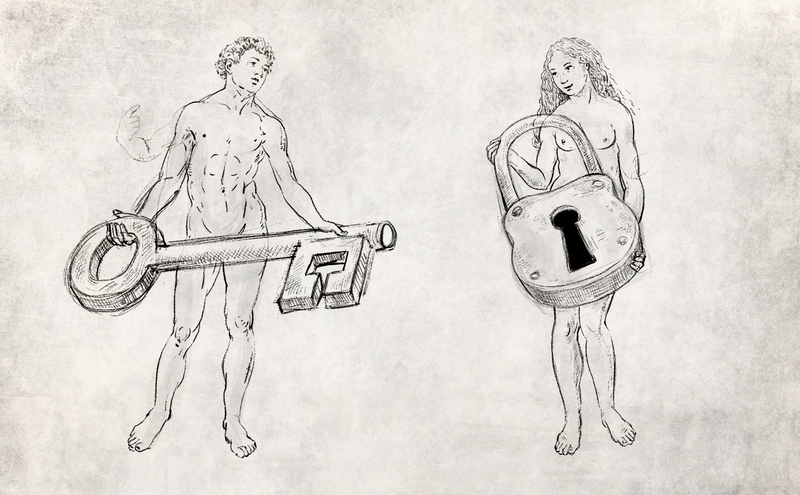 By the end of the Renaissance, dozens of different designs cropped up, and lock-picking became a craft itself. Naturally, the desire to craft an unpickable lock became paramount. The lock still wasn’t completely secure, however. With the right tools and skills, the lock could be picked, although it was more difficult in locks with more levers involved. Adding more variables would increase security, so it didn’t take too long for another Englishman to trump Barron’s design. In 1784, Joseph Bramah patented a high-security lock that’s still manufactured and sold in London today. The design remains virtually unchanged. A cylindrical key presses a series of wafers inside the locking mechanism that serves a similar purpose to the levers in Barron’s lock: The right key hits the wafers at specific depths and retracts the bolt. Bramah was so confident about his lock’s security that he displayed a “challenge lock” in his store’s window in 1790 and offered 200 gold guineas to anyone who could pick it. (That much gold is worth about $200,000 today.) It remained unpicked until American locksmith Alfred C. Hobbs successfully cracked it at the Great Exhibition of 1851. It took him 51 hours. The Bramah lock’s superiority at didn’t stop others from innovating, however. In 1817, a burglary in Portsmouth Royal Dockyards prompted the British government to hold a competition for the creation of a lock that couldn’t be opened without the proper key. The £100 prize went to Jeremiah Chubb who improved upon Barron’s design with his own lever tumbler lock. He added a built-in relocking feature: The so-called detector lock would intentionally jam if the wrong key was inserted. Only the proper key could then open the lock. The Chubb detector lock also remained unpicked until the Great Exhibition when—you guessed it—Alfred C. Hobbs opened it. Hobbs’ legendary showing at the Great Exhibition spelled the beginning of the end of England’s reign as masters of master locksmithing. “We believed before the Exhibition opened that we had the best locks in the world,” reported The Times, “and among us Bramah and Chubb were reckoned quite as impregnable as Gibraltar.” American innovation would trounce that tradition. By the time Cobbs shocked the Great Exhibition of 1851, the future of security was already happening in the United States. In 1843, Linus Yale Sr. patented his pin and tumbler lock, now known simply as the Yale lock. The design was essentially an improvement on the simple wooden tumbler lock created by the Egyptions. Linus Yale Jr. improved upon the design in 1861, inventing the now ubiquitous flat grooved key with notches on the edges. This is probably the same type of lock you have on your front door. The genius of the Yale lock is its marriage of simplicity and security. Instead of adding more levers or complicated keys, Yale’s design perfected the ancient pin tumbler lock. The compact key that opens the lock, however, makes all the difference. With lateral grooves as well notches cut to fit a specific lock, the key will slide into the keyhole and move spring-loaded pins. The locking mechanism contains a plug that must rotate in order to throw the bolt. In order to rotate the plug, the key has to get those pins out of the way. Over the course of the next century-and-a-half, locksmiths would keep introducing new designs and improving upon Yale’s design. Around the turn of the 20th century, however, came one of the first intimations that a lock might do something more than opening or closing a latch. In 1909, Walter Schlage patented a door lock that could turn the lights on and off. Schlage would later invent the cylindrical pin-tumbler lock with a push-button locking mechanism, a convenient little innovation on the Yale design that you’ve probably used a million times in homes and businesses. The company that Schlage founded remains one of the world’s biggest lock manufacturers. But his idea that a lock could be more than a lock would have to wait till the digital age to flourish. The development of physical security is much more complicated than a linear history of locks and keys. The ancient Romans also pioneered the earliest combination locks, transforming the key from an object into an idea. James Sargent advanced this idea even further by inventing the world’s first key-changeable combination lock in 1857. Sargent made locks smarter when he created the world’s first time lock, which would only open at a set time, and time-delay locks, which would only open after a certain interval, in 1873 and 1880, respectively. The idea of an intuitive lock that would only open for a certain person at a certain time took off in the late 20th century. Tor Sørnes patented the first electronic keycard lock in 1975, opening a new market for programmable locks. In recent decades, electric locks have made use of all kinds of authentication methods, from passwords to biometric data like fingerprints. Digital keys like security tokens and RFID tags have given us a world where blasts of infrared light or sequences of ones and zeroes will open doors. You can now even open some doors with your face. Until recently, the most modern access control technology was reserved for government and businesses. Installing a facial recognition security system is not cheap. As the internet of things becomes more pervasive, however, the world’s oldest lock companies are looking for ways to put the newest technologies into people’s homes. The end goal, it seems, is to do away with the very lose-able and spoof-able physical key. Lock veterans like Yale and Schlage—along with a burgeoning number of startups—intend to lead the way toward a keyless future. This year, both companies announced new connected locks that will open with the swipe of a smartphone or even the sound of your voice. Schlage’s new Sense lock works with Apple HomeKit so you can use Siri to open your deadbolt. It also works with an old fashioned key. Meanwhile, Yale’s new Linus lock takes things a stage further: There is no physical key. A touch-sensitive panel that mounts on the outside of the door allows you to set up to 250 individual codes. That way, you can give your kids, friends, and neighbors specific codes and keep track of who’s coming and going. The Linus lock also works with Nest’s new Weave protocol so that you can connect the lock to any number of devices in your home. Imagine coming home, unlocking your door, and triggering a series of other devices to fire up. Maybe your TV turns on to your favorite channel and your shades go up. Maybe your thermostat cranks up the air conditioner and your lights turn on. Once your lock is connected to the internet, it opens the door for hackers to raise hell. While many smart locks have multiple layers of security, they’re also collecting data on your comings and goings. Some might see this as a feature. Some might think it’s needless surveillance. Inevitably, connected locks are adding a new layer of complexity to a technology that’s always been relatively simple to use. Using next generation methods like geofencing, near-field communication, and Bluetooth, these gadgets can do more than your old Yale lock. It’s easier than ever to see how the future of physical security could be based on encrypted networks that can evolve and learn. The technology that could detect when you’re walking up to your front door and open it before you reach for your keys already exists. Now, it’s a race to see whether we really want these advanced security solutions make our lives more secure and convenient. Humans have been using old fashioned keys opening simple tumbler locks for thousands of years. Maybe we don’t need anything more advanced. But surely people will pay money something new and shiny and a little bit more secure.